Alvechurch will see a world premiere next month as members of Alvechurch Dramatic Society take to the stage in their very own pantomime. Local athlete Sam Boswell has returned from the Duathlon World Championships with a Bronze medal. Seen by many as the biggest thing to happen to this area in perhaps centuries, the day the Pope popped in passed by barely noticed . . . on the outside of the fence, at least. Funding through the newly formed Alvechurch Communities Together has been found to ensure the Citizen’s Advice Bureau will continue to have a presence in the village over the next year. Villagers who raised the alarm over a night-time fire at a children’s nursery last month may have saved a prominent Alvechurch building. Antisocial behaviour around the MUGA in Alvechurch more than halved during the summer months, according to police. Two local events provided a grand day out for all the family. Withybed Green youngster Greg Smith is celebrating after his triumph at the British Crown Green Bowling Association Junior U18 Finals, when he lifted the title of Junior Champion for the second time in three years. Alvechurch will once again have a grassroots forum where villagers can discuss matters affecting their community. Three youth workers have been hired by the new youth club in Alvechurch, with youngsters helping to decide what sort of people they wanted and even being involved in the interview process. Aston Fields villagers are stepping out in protest against a housing development they fear could bring their community to a standstill. The second Memorial Golf Day organised by Craig Bromley, of Alvechurch, in memory of his father, John, raised four times last year’s figure. Alvechurch Village Hall has benefited from a comprehensive makeover after securing grants from three major sources: the Lottery Fund, Grassroots and Welcome to Our Future – an organisation dedicated to sustainable development which manages the Severn Waste Environmental Fund in Worcestershire and Herefordshire. Alvechurch businessman Mike Bingham is looking for volunteers to trial a new service for elderly people and their families. Horseriders have been urged to clear up after their animals on village roads. Headteacher Janette Morris cuts the ribbon to open the new ‘outdoor classroom’ at Crown Meadow First School, Alvechurch, watched by pupils and members of the school PTA (from left) Penny Church, Libby Price, Helen Fieldhouse, Phoebe (Year 4), Ben (Year 4), Tim Edwards, Mandy Davies and Ruth Rachman. 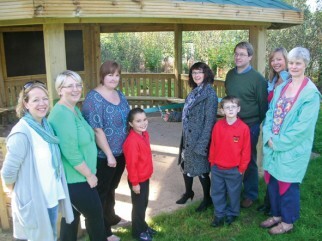 The PTA raised £8,000 for the wooden shelter over the past 18 months from a wide variety of events.